Do your kids love playing heads down, thumbs up? I know some people call it heads up, 7 up. I bet I get asked 20 times a day if we can play this game. Since they love it so much I decided to throw some learning into the mix! Sight words! I really thought I had blogged about this before but I can’t find the post so I’m sharing this little gem of a game with you again! For those of you that don’t know the rules to heads down, thumbs up, here’s how you play: I choose 3 kids to be it and turn the lights off. Everyone else puts their heads down on their desk and sticks their thumb up in the air. The 3 that are standing then go around and choose someone. If their thumb is tapped then they put it down. When the lights are turned back on those who had their thumb touched stand up. They then try to guess who picked them. If they guess correctly then they trade spots with that person. If they guess wrong, they have to sit back down. Here is where the learning comes in! The 3 that I pick to be it are each given a sight word card. 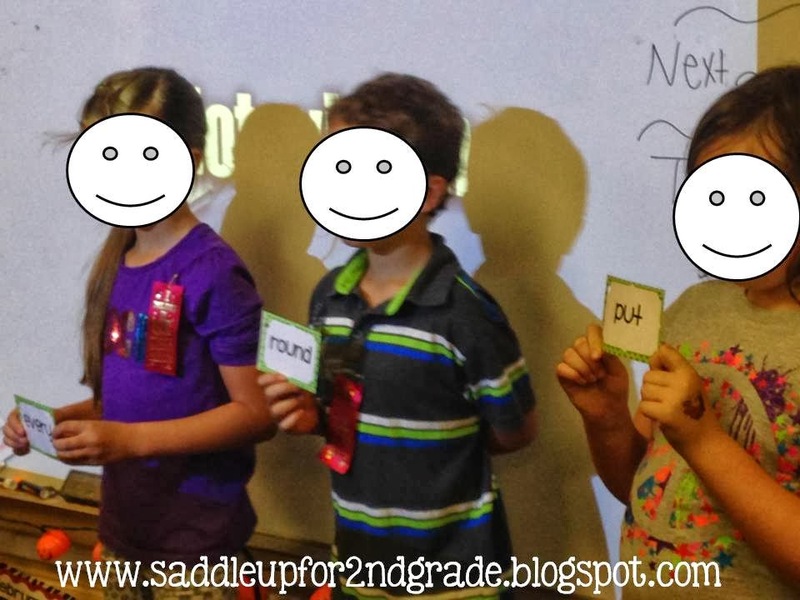 When its time to guess who picked you, the student must call out the sight word that that person is holding instead of their name. For example: If one of the kids in the picture below picked me. I could call out the word “round”. If he picked me then we would trade places. If I’m wrong then I sit back down. I like to play this when we have a few minutes to spare and I need a quick filler! I sometimes do this with our weekly spelling or vocabulary words too. They love it and its great for a quick review!